distribution Essentially statewide. Possibly absent in one to several high-elevation mountain counties, and possibly a county or two along the Outer Banks. Nonetheless, the assumption should be made that it occurs in all counties. abundance Generally fairly common (to locally common) across the state, though certainly rare in the extreme eastern counties and in the higher elevations. 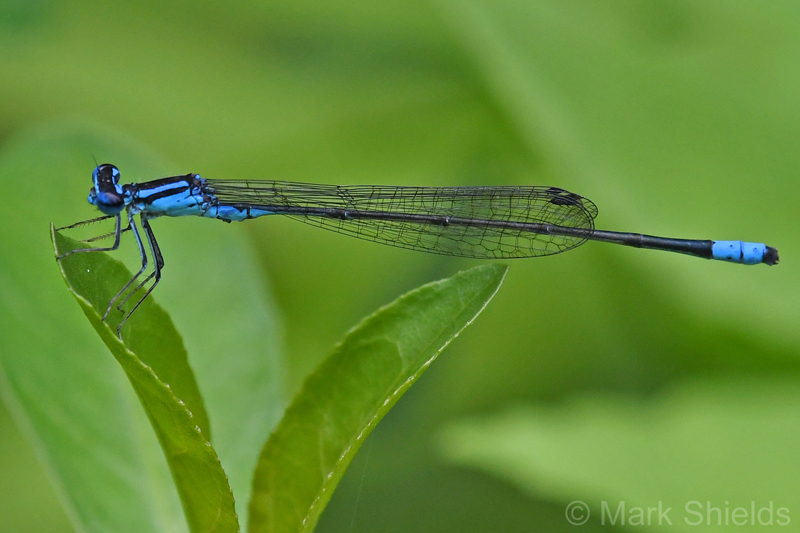 A one-day count of 120 was made in the eastern Piedmont in 2014, tripling the previous single one-day count of 40; a count of 150 was made in a southern coastal county in 2018.
flight This is another bluet that ends its flight by mid-summer, as opposed to in the fall season. In the Coastal Plain, it occurs from early April only to mid-July. The Piedmont flight is from late April to mid-July, and the mountain flight is slightly later -- early May to late July. There are no August records as yet for the entire state. habitat Varied. More often at slow-moving streams, but it also is found along pond and lake margins. comments It seems odd that the known counties for it in the mountains are spottily distributed, considering that there are a few notably high counts for the species there. This suggests that the species can be numerous at the lower elevations (below 3,000 feet), but that at middle and high elevations can be quite scarce. There are relatively few recent records from the Piedmont, and essentially no photos; has it declined in this province?